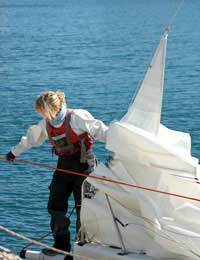 Ocean sailing races are remarkable in being more a test of personal physical and psychological strength and stamina than a competition with other sailors. Like any race speed plays a vital role in ocean racing, but what sets ocean racing contests apart is their incredible test of mental and physical endurance. After all when Sir Robin Knox-Johnston completed the first non-stop circumnavigation of the globe in 1969 as part of the Sunday Times Golden Globe Race it wasn’t because he was particularly fast – he was just the only competitor who managed to complete it. The celebrated successes of Knox-Johnston and, earlier, Sir Francis Chichester, would lead to the foundation in 1973 of the Whitbread Round the World Race, hailed as “the longest, most demanding and perilous sporting contest the world had known” and, in keeping with its status as more a feat of endurance than a race, it has also been referred to as the “Everest of Sailing”. That race survives today but with new sponsors it is now known as the ‘Volvo Ocean Race’. Experience and advances in sailing technology may has diluted some of the hair-raising fascination of what was once a voyage into the unknown but it still stakes its claim as the ultimate combination of top class sporting competition and seat of the pants adventure, combining onshore glamour with high sea drama. Beginning and ending in Europe the route alters each time but invariably takes in between 35 and 40,000 nautical miles, at least 9 months at sea and some of the world’s most treacherous waters. Unlike Knox-Johnston’s relentless voyage, it takes place over several legs, and incorporates stops at various ports around the world, where short in-port races take place. For many the glamour and numerous breaks of the Volvo render the event less an ultimate feat of endurance than a rather elaborate parade, albeit still a hugely demanding one. Instead, they believe, it is the Vendee Globe race that offers the greater maritime challenge because, just like the original Golden Globe race, it restricts entry to solo competitors and doesn’t allow any stops on route. By imposing these rules it further increases the demands on its competitors, intensifying the psychological, physical and emotional strain they undergo. This remarkable test of endurance hit the headlines in 2001 when the then 24 year-old competitor Dame Ellen MacArthur returned to Les Sables d’Olonne in France as the youngest and fastest female to sail all the way around the globe. It took just 94 days for the young Brit and her vessel the Kingfisher to circumnavigate the world eastwards. Once you’ve sailed around the world it is difficult to think of an even greater challenge beyond doing multiple times. The Global Challenge – which has been variously sponsored by British Steel and BT – offered its own more novel take on the familiar theme by challenging its amateur competitors to sail around the world the ‘wrong way’, taking the westabout direction against the prevailing winds. The race is also notable for being aimed at amateur sailors who pay to take part. Knox-Johnston himself helped conceive a similarly amateur-focused competitor to the Global Challenge called the Clipper Round The World Yacht Race, but which distinguished itself from its rival by using lighter, faster boats and by following prevailing currents and winds. Needless to say pushing yourself to the very limits of sanity and surviving is not necessary to prove yourself as a master sailor. There are other ocean-traversing races that while still presenting a hugely intense challenge focus more on the familiar sporting attributes of speed and skill. The Single-handed Trans-Atlantic, or STAR, is a yacht race across the North Atlantic from Plymouth to the USA that was co-conceived by Sir Francis Chichester. Inaugurated in 1960 it is notable for being the world’s oldest solo challenge and is open to professional and amateur sailors. Another notable single-handed trans-Atlantic race is the Route du Rhum which takes place every 4 years between St Malo in France and Pointe-a-Pitre in Guadeloupe.